To build a successful new business, many events must come together in harmony, including choosing a site, getting equipment, finding staff, raising capital- and much more. The story of The Walkerville Brewing Company is a study in perseverance and makes true the adage: the harder you work, the luckier you get. The concept for the Walkerville Brewing Company formulated about five years ago when Karen Behune Plunkett and her husband Michael Plunkett, proprietors of the popular downtown eatery Plunketts, initiated market research on the feasibility of establishing a micro brewery in the Windsor area. At the turn of the century, Walkerville was home to one of the largest and oldest breweries in Ontario. Its celebrated beers were delivered in wagons stoked with oak kegs and drawn by stately draft horses. Behune Plunkett appreciated Walkerville's deep roots in the beer brewing industry, with the original Walkerville Brewery located at the corner of Walker Road and Wyandotte. Behune Plunkett was lured to Walkerville, but found it difficult to locate a building to house a brewery- one that would allow for expansion should the venture prove out. "Walkerville was once the industrial capital of Canada, with many fine warehouses and factories. Sadly, when I was searching for a historical building, I couldn't find any in the area." The entrepreneurs had to consider locations outside Walkerville. "We thought we had to settle on a location in South Windsor; obviously, this would require a rethinking of our marketing, which was focused on Walkerville's unique heritage. But then, fate stepped in." A close friend learned that the Canadian Club blending house on Argyle north of Wyandotte was coming on the market. As soon as Karen entered the building, she fell in love with the site. "It had this incredible aura, and we knew it was right." After lengthy negotiations, an arrangement was made. Instead of Walkerville Brewing Company purchasing the building, Mike Brkovich would buy the old blending house and two big Walker warehouses, and Walkerville Brewing Company would be a long-term tenant. The next challenge was to remove the old Canadian Club distilling equipment from the building. As it turned out, the only way to accomplish this was by crane through the roof. 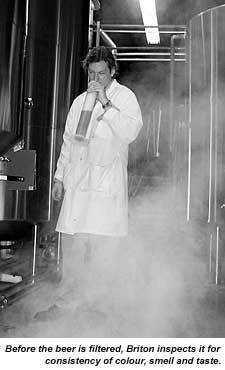 The next event that shaped the new venture was securing brewing equipment. While negotiating to purchase new equipment from the manufacturer, Behune Plunkett learned that a brewery in Waco, Texas had entered into receivership. The equipment was virtually brand new and perfectly suited the needs of The Walkerville Brewing Company. 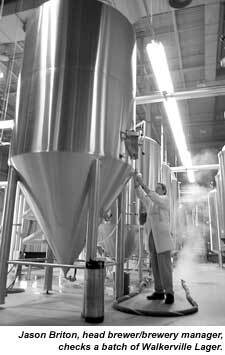 This was a turn-key brewing system, and after some negotiations, the equipment found its way into the old distillery on Argyle Rd.- at a great savings compared to new equipment. The next step was to secure the services of a Master Brewer. Doug Babcock, an internationally famous Master Brewer, was hired exclusively to design the recipe for the signature beer, Walkerville Lager. Jason Briton, head brewer at the Amsterdam Brewery in Toronto, assumed the role of Head Brewer/Brewery Manager. The goal was to create an all-natural beer with high integrity and a soft finish. In December, 1998, the first shipment of Walkerville Lager was delivered in kegs to The Old Victoria Tavern in Walkerville. Next came the task of building the brand. The education process has spread through word and mouth and aggressive sales into local drinking establishments. "Drinking Walkerville Lager is like the difference between mass-produced and fresh baked local bread," says Behune Plunkett. "Once people try it, they become fans and our best sales force." Initially, people assumed Walkerville Brewing Company was a U-Brew outfit, where one could brew their own beer. But once they figured out this was a legitimate operation, brewing a distinctive beer right here in Walkerville, acceptance was swift. Fourteen months after the first keg was tapped, the beer is in great demand locally, available in over 100 establishments. Coupled with an aggressive local sales force, the company supports numerous charitable events and is the official beer of the Epicure Festival held at the Riverfront Plaza in the summer. 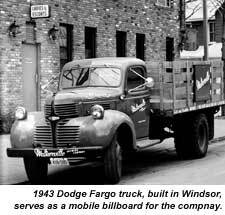 The company's 1943 Dodge Fargo truck, built in Windsor, has served as the company's mascot, promoting the distinctive stylized logo throughout the city. Walkerville Brewing Company sales reps have worked hard to build inroads into drinking establishments that typically prefer to deal with the large breweries such as Molson's and Labatt. But the local reaction to the heritage of Walkerville, and a sense of civic pride, coupled with the lager's smooth taste, has led to its success. Since bottling beer is an expensive process requiring a high sales volume to justify the production costs, the company decided to sell beer to restaurants and drinking establishments in large kegs. However, the public demanded a way to take the fresh amber nectar home- thus the Growler Jug was born. Growlers are an American tradition, resembling moonshine jugs. Rumour has it that when the beer sloshed around the jug, it created a rumbling sound as the C02 escaped, created a growling sound. Walkerville Lager Growlers have become exceedingly popular and are available exclusively at the brewery on Argyle Rd. Speaking of taste, what gives the beer its distinctive flavour lies in its all natural process known as hand-crafting. "We use only four ingredients," says Behune Plunkett. "Water, yeast, hops and malt. The amber colour is a trade secret-we have developed a beer that has lots of character, is very fresh and has a soft finish." In the future, Behune Plunkett would like to expand the base of support for the product. "We'd like to have a greater presence in Essex County, and also expand into Chatham-Kent Counties. We are also exploring the Michigan market but the distribution of beer is tightly controlled, so it makes it a little more challenging for us."